On 2nd April 2016, eight teams of apprentices and four teams of high school students gathered at NZ Marine headquarters, Westhaven Marina, to face off for the 16th annual Marine Trades Challenge. With two apprentices, one tradesperson and a team manager, teams had three hours to build a small catamaran capable of carrying two team members at a time using outboard power, sail and paddling. With uncertain weather conditions teams raced to build quality boats with some teams contributing their own designs for cross arms and rigs. After a barbeque lunch the weather brightened and teams headed for the beach to begin the race. The high school teams were the first to race. Although Mercury Bay won on the water it was Auckland Grammar School that took away first prize with Mercury Bay Area School chasing second place overall. The winds died drastically and the sailing leg was abandoned, leaving outboard and paddling for the company teams. The race was swift and full of enthusiastic cheers from the shore with all teams desperate to take out the win. Bluefix Boatworks took out the Transpac trophy for first place on the water. C-Tech claimed the Gurit trophy for best performance for first time entrants. Southern Spars won the first place non-boatbuilders EAL trophy. The manager award was won by Jon Leverne of FRP. 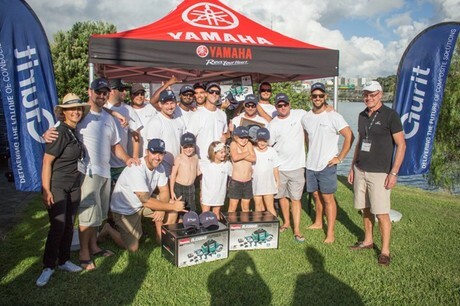 Orakei Marine took out the Survitec team support & presentation trophy, the North Sails/Southern Spars trophy for innovation, the NZ MAC ITO trophy for health and safety, the 37 South best built boat trophy and the Harken overall trophy. Organised by the New Zealand Marine and Composites Industry Training Organisation, the Marine Trades Challenge is a fun filled day for marine and composites tradespeople to show off their skills and knowledge and is a great opportunity to network with others in the industry. Adhesive Technologies, Backwater Marine, Bailey Marine/Fixtech, BBS Timbers, Chains, Ropes and Anchors, FRP, Gurit, Harken, International Paints, Makita, North Sails, Nuplex Composites, New Zealand Composites, NZ Marine, Southern Spars, Survitec Group, Tohatsu Outboards, Yamaha, and Yachting Developments.